The account has all information about your membership, this is your user profile. Once you have registered, you will receive your personal account in the fotocommunity. This includes, depending on the member state different areas and ways to present yourself to the community and to interact. Your public profile is your business card in the fotocommunity. Each photo or text contribution in the fotocommunity is automatically linked to your public profile. So you are yourself responsible for your text and image contributions. We recommend that you write a descriptive text and upload a profile photo. This makes the fotocommunity personal and also shows that you’re not as x-any anonymous user. The profile text does not need to be a novel, but a few sentences about what photography as a hobby means for you looks inviting. Experience shows that photographers get with a meaningful profile and profile picture much more comments under their photos. You can change your profile at any time, when you are logged in to fotocommunity by clicking on the top right in your name and then on “Profile”. Once your profile page is open, you can find the “Edit info” button under your profile photo. Under the profile photo, others have the opportunity to put you on their friends list, or subscribe to your pictures. 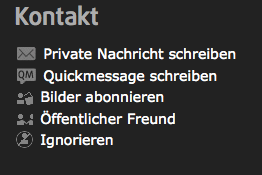 In addition, you can send a Quick Message (a small private message within the fotocommunity) – or send a private message to your e-mail address. In your profile other members can leave comments. Here you have the ability to delete individual notes, when the profile is too full of comments. If you have signed the privacy settings, your recent activities are displayed on the profile page, for example, if you have uploaded a photo, have written an article in the text forum or commented a photo. You can also delete selected individual activity logs from the list here. These activities appear otherwise on “My news” with those who you have on your friend list. In “My community ” you see in return all shared activities of your friends. If you are a model, you can create a sedcard for your profile. You do not need to provide offers to your modeling activity in your profile text. This goes directly to the sedcard. The “Favorites” shows the photos that you have put on your favorites list. A distinction is made between private and public favorites. My photos and photos of friends. The area photos consists of your photos which you have uploaded to the fotocommunity. A distinction is made between “Public photos” and “Private photos”. Photos of friends gives you an insight into the latest pictures of your friends. Note that the profile is truly public. The photo community is a public platform and not only registered members, but also external visitors have access.